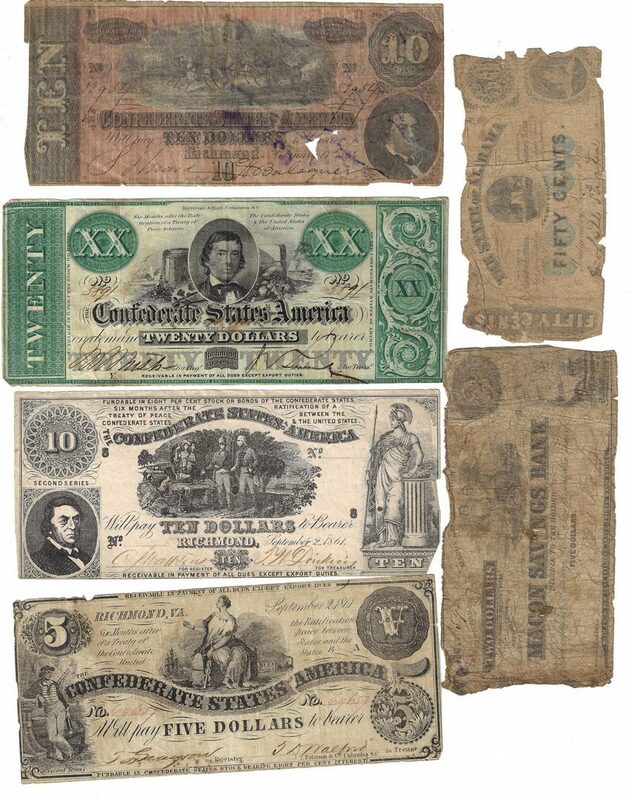 Seventeen (17) Confederate States of America (CSA) and Southern Obsolete banknotes, inc. McDonald Battalion signed. 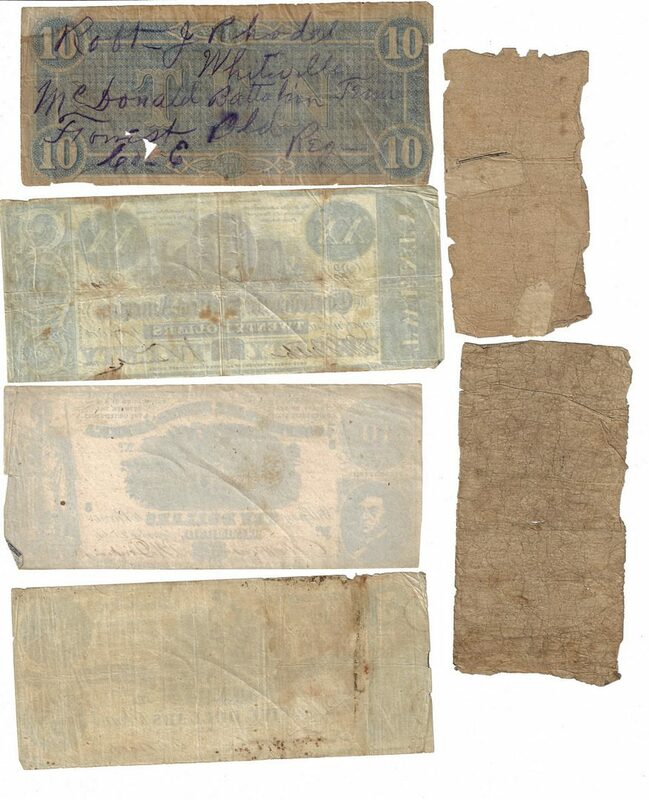 1st item: One (1) $10 bill, signed by Robert J. Rhodes, 3rd (Forrest's Old) Cavalry Regiment, known as McDonald Battalion after the Battle of Shiloh, April 6-7, 1862. Issued in Richmond, VA, February 17, 1864, engraved by Keatinge and Ball, Columbia, SC, printed by Evans and Cogswell, Charleston, SC. Vignette of a battle scene, top center, portrait of Robert M.T. Hunter, CSA Secretary of State and Confederate Senator, lower right. Serial Number 52954/ pp B. Blue crayon inscription reads "Robt_J Rhodes/Whiteville/McDonald Battalion Tenn/Forrest Old Reg_/Co_E" en verso. Note: 3rd (Forrest's Old) Cavalry Regiment was organized at Memphis, Tennessee, in October, 1861, as an eight-company battalion. In January, 1862, it was increased to regimental size. The history of this unit is very complex because over twenty companies from Tennessee, Kentucky, Texas, Mississippi, and Louisiana were attached to it at one time or another. After the Battle of Shiloh, four companies were transferred to the 4th (Russell's) Alabama Cavalry Regiment and thereafter it was called 18th or 26th Battalion, Balch's Battalion, and McDonald's Battalion. It fought at Fort Donelson and Shiloh, and during April, 1862, contained 463 effectives. The unit was attached to Forrest's, F.C. Armstrong's, and E.W. Rucker's Brigade, and served in the Army of Tennessee and the Department of Alabama, Mississippi, and East Louisiana. It confronted the Federals in Tennessee, Mississippi, Kentucky, and Alabama, and surrendered in May, 1865. The field officers were Colonels Nathan B. Forrest and David C. Kelley; Lieutenant Colonels P.T. Allin, Robert M. Balch, and Edward E. Porter; and Majors James C. Blanton, William H. Forrest, Charles McDonald, and Edwin A. Spotswood. (source: https://www.nps.gov/civilwar/search-battle-units-detail.htm?battleUnitCode=CTN0003RC). 2nd item: One (1) $20 bill, issued in Richmond, VA, September 2, 1861, printed by Blanton Duncan, Richmond, VA. Vignette of Industry behind the number "20" with Commerce and a beehive, top center, vignette of a goddess with an anchor and a palm tree, center right, portrait of Alexander Stephens, CSA Vice President, lower left. Serial Number 151151/ pp 7. 3rd item: One (1) $20 bill, issued in Richmond, VA, September 2, 1861, engraved by Keatinge and Ball, Columbia, SC. Portrait of Alexander Stephens, CSA Vice President before a decorative vignette, top center. Serial Number 5891/ pp Y. 4th item: One (1) partial Bank of Commerce, Savannah, GA, $20 bill, 1857. Vignette of cattle, lower left, vignette of a boating scene, lower center. Serial number not present/ pp B. Cashier signature. 5th-6th items: Two (2) $10 bills, Series 2, issued in Richmond, VA, September 2, 1861, printed by Blanton Duncan, Columbia, SC. Vignette of the painting General Marion Inviting a British Officer to Share His Meal by John Blake White, top center, portrait of Robert M.T. Hunter, CSA Secretary of State and Senator, lower left, vignette of the goddess Minerva, right. Serial Number 106545/ pp 8, [blank]/ pp 8. 7th item: One (1) $10 bill, issued in Richmond, VA, September 2, 1862, printed by Hoyer and Ludwig, Richmond, VA. Vignette of Ceres, top center, portrait of Robert M.T. Hunter, CSA Secretary of State and Confederate Senator, lower right. Serial Number 9257/ pp l. 8th item: One (1) $5 bill, issued in Richmond, VA, September 2, 1861, lithographed by J. T. Paterson & Co., Columbia, SC. Vignette of Commerce seated, top center, vignette of a sailor, lower left. Serial Number 69657/ pp A. 9th item: One (1) partial Macon Savings Bank $5 bill, issued in Macon, GA, March 16, 1863, printed by Blanton Duncan, Columbia, SC. Vignette of two allegorical female figures, top center, vignette of a sailing ship, lower right. Serial Number 6592/ pp A. Cashier signature. 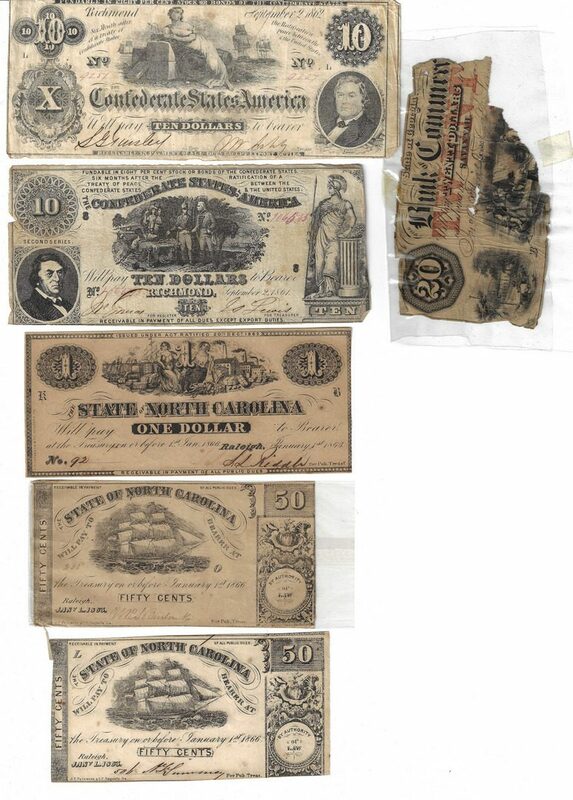 10th-14th item: Five (5) State of North Carolina $1 bills with sequential serial numbers, issued in Raleigh, NC, January 1, 1863, printed by J. T. Paterson & Co., Augusta, GA. Vignettes of Shipping and Industry flanking the number "1", top center. Serial Number 92, 93, 94, 95, 96/ pp B. For Public Treasurer signatures. 15th-16th items: Two (2) State of North Carolina 50 cents fractional notes, issued in Raleigh, NC, January 1, 1863, printed by J. T. Paterson & Co., Augusta, GA. Vignette of a sailing ship, top center. Serial Number 238/ pp O, [blank]/ pp L. For Public Treasurer signatures. 17th item: One (1) State of Alabama 50 cents fractional note, issued in Montgomery, AL, January 1, 1863, engraved by J.T. Paterson & Co., Augusta, GA. Vignette of the map of Alabama on a tree, top center, portrait of Lucy Pickens, the "Queen of the Confederacy", lower right. Serial Number 1909/ pp K. John Gill Shorter, Governor facsimile signature. Majority of bills with For Register/For Treasurer signatures unless specified. 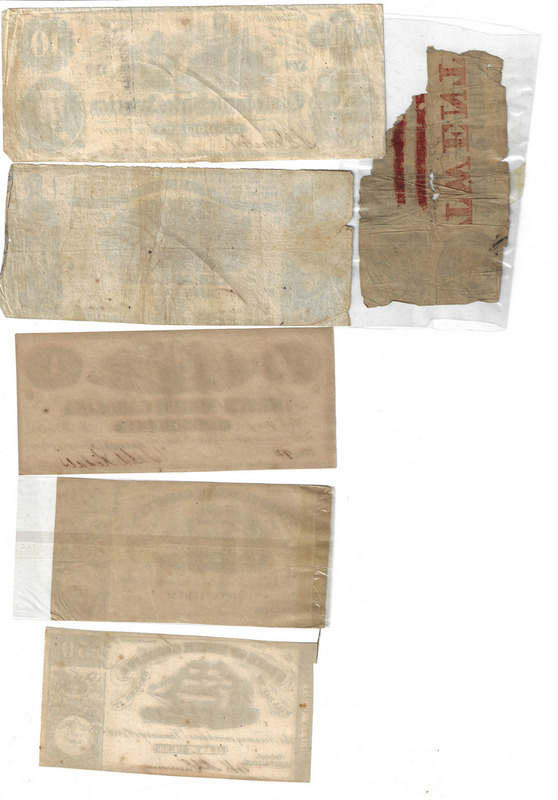 Bills range in size from 2 1/2" H x 5" W to 3 1/4" H x 7 1/2" W. Mid 19th century. Provenance: the collection of Benjamin Dysart, Brentwood, Tennessee. 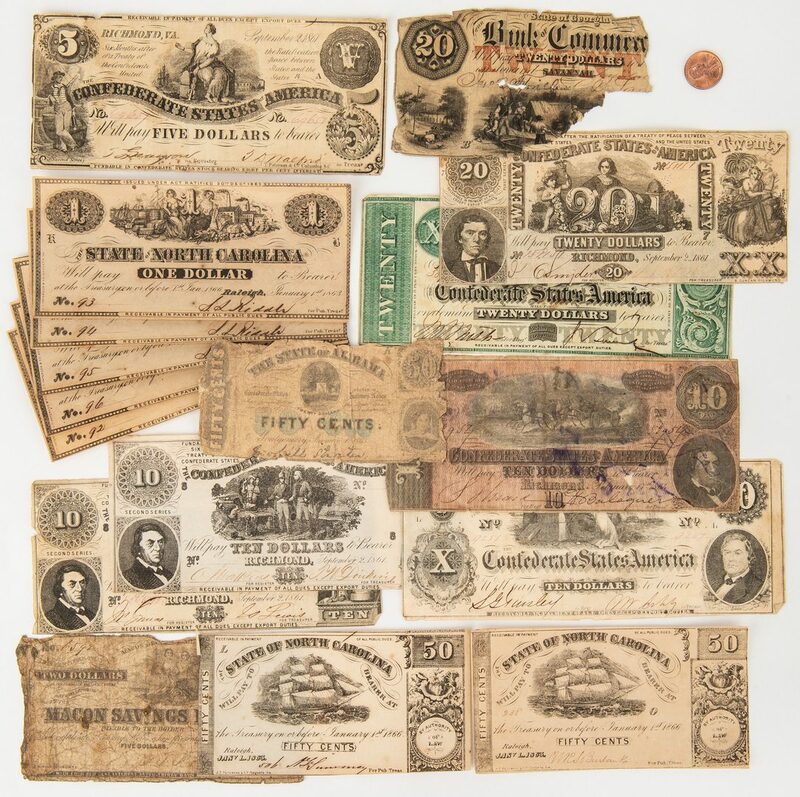 CONDITION: All bills in circulated condition. 4th item: Lower center to top right of bill is not present, including serial number and part of second signature. 9th item: Left side of bill with vignette is not present.